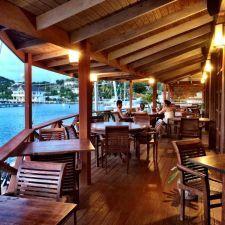 Antigua restaurants: Cloggy's Café, English Harbour. 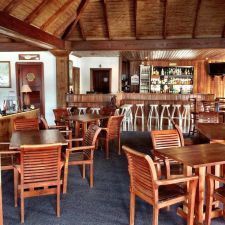 This bustling Café, located on the second floor of the Antigua Yacht Club Marina Building in English Harbour has stunning views over Falmouth Harbour and the multi-million dollar yachts which sail in and out of Falmouth Harbour daily. Indoors, the lively cafe has a full bar, table seating and a lounge area with low sofas and easy chairs. Outside on the gallery are tables with great views over the harbour and cooling breezes. 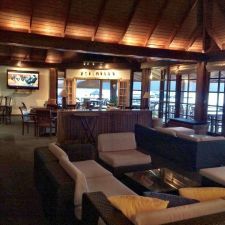 This layout offers a choice of seating perfect for large groups, meeting your best friend, having a business meeting (internet connection for laptops available), or simply taking time out for yourself. Sporting fans can catch up with football matches worldwide, formula 1 racing and any other great sporting moments in the sports bar inside. Your friendly hosts Vanessa and Ton offer a simple menu inspired by their Dutch roots, hence the name, with a smattering of Mediterranean influences at consistently excellent quality. Only the freshest ingredients and seasonal vegetables are used to create tasty, colorful dishes served at Café speeds - perfect for a stolen lunch break or an afternoon and evening of lingering over excellent food and cooled wines. Stop by from 12 noon until 4:30 pm, Tuesday through Saturday for enticing lunches, and Wednesday through Saturday from 6:00 pm until 9:30 pm for delicious dinners. Come in and out or linger over the lovely view into the evening. Choose from salads, sandwiches and local dishes. Be sure to come by on a Sunday for their delightful Sunday Brunch running from 11:30 am to 4:30 pm. Drinks are available all day from around 10:00 am until late in the evening. We specialize in excellent wines, with our Rose and Pinot Grigio a particular favourite, beers and cocktails (just ask the bartender for a specialty), as well as fresh juices and 100% fruit smoothies. Come and spend lazy afternoons on the gallery chatting with friends or watching the world go by. Come and enjoy some of our European hospitality with a definite Caribbean twist at Cloggy’s Café today.